San Luis Cove from southeast La Tejona. Tilaran from southwest La Tejona. There's a shallow pass through the southern hills through which the highway runs from Tilaran to the lake. The hilly area to the immediate northwest of the pass is known as La Tejona. A resident at the brow of these hills can look to Tilaran and the western lowlands, to the east toward the Arenal Volcano, and to the north to Lake Arenal. 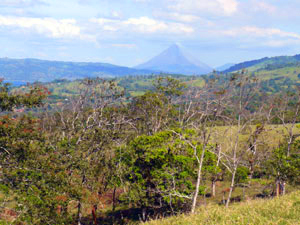 Residents of other parts of the La Tejona hills can look just to the southwest to the Guanacaste lowlands or to Lake Arena largely to the northeast. It is exceedingly pretty country with beautiful local terrain in addition to its wide views, and the area is full of fascinating wildlife such as toucans and monkeys. There is a variety of bulding sites available, in or out of planned communities and in lot or multi-acreage configerations. As always, the listings we show for this area do not exhaust the properties available, and we would be glad to lead you to others which may more closely fit your criteria. H66 Heirs selling 2BR 2BA almost complete view home on 1/2 acre - $170,000 (Off market). 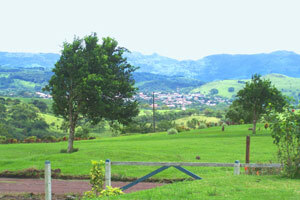 A65 7.2-acre finca with pretty wooded areas, meadows, springs, distant views - $87,291. 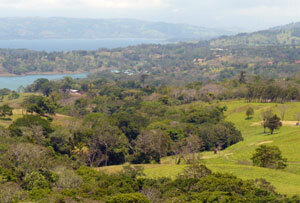 A40 46-acre finca with springs, streams, wetland, forest, cattle crops - $1,480,000 negotiable. L21 5 lots of 1.4 acres each beside lake road at foot of Tejona hills, $113,312 each. The Tejona hills are broad and complex. Arenal Volcano to the southeast.